Sunday being the day of rest and whatnot, people often like to have a nice big brunch on Sundays to relax with away from the stresses of the workweek. Today I felt like doing something different from my regular breakfast routine and decided to have pancakes. Using a whole wheat pancake mix, I made health-conscious chocolate chip pancakes! Substituting chocolate chips for some leftover carob chips I had from making cookies, the result was quite delicious. 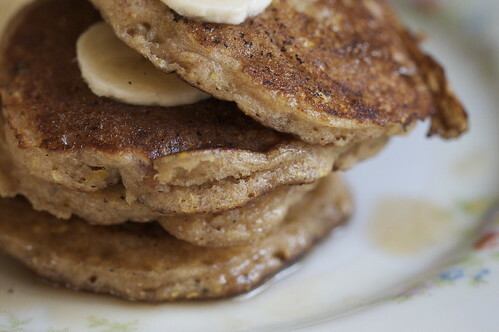 Topping the pancakes with bananas proved to be a truly yummy breakfast! And if need be, pure maple is a healthy way to sweeten them up.